The Importance of Welding and Abrasives - ARC Abrasives, Inc. Abrasives perform a very important function in the welding process. Metalworking specialists in the industry know that by increasing output and decreasing costs in welding can be determined by selecting the right family of products. However, it is paramount to understand the different welding methods to make an informed decision on the right product choice. Welding is the process of melting and fusing two distinct parts together by applying heat to form a permanent bond. This process is the most common, economical, and efficient way to join metal. Once melted, a filler material is added to form a weld puddle that becomes a strong joint once cooled down. Welding is used in markets such as shipbuilding, automobile manufacturing, aerospace, and other ventures. The process is also used to join beams when constructing buildings, bridges, and other refineries. To make for a more intricate career, there are several types of welding that are used in various industries. MIG welding is one of the easiest and most cost-effective ways to learn the trade. There are two separate ways to learn this style of welding. Bare wire MIG welding can be used to join pieces of metal together and proves to be safe indoors. Flux core MIG welding does not require a gas supply or flow meter and can be used in an outdoor setting. Also known as Arc welding, stick welding was the first of its kind. A stick electrode welding rod is used for the process. This style is more difficult to master than MIG welding, but one of the least expensive ways to get the job done. TIG welding is one of the more difficult welding techniques to learn. Due to its versatile nature, two hands are needed because one hand feeds the ride while the other hand holds the torch. The welding torch creates the heat and arc that welds aluminum, steel, nickel alloys, copper alloys, cobalt, and titanium. 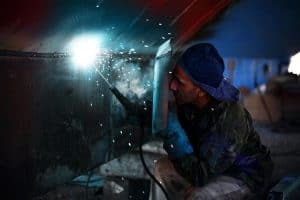 If you are looking for a more precise technique, plasma arc welding is the better route to go. This process is commonly used in aerospace application. An example of an application would be an engine blade or air seal which are incredibly important. Plasma arc welding has a similar technique as TIG welding but uses an excessive electrode and ionizing gases to create heat. Electron beam welding and laser beam welding are very popular methods of welding that use a high-speed stream of energy for precision. These methods are widely accepted due to no gas contamination and cleaner welds. The downside of the process is the high initial setup cost. Gas welding is rarely seen and TIG has essentially taken its place. On some occasions, this method is used to weld exhaust parts in the automotive industry. If the metal consists of two pieces that will be joined, you may need to prep by using an abrasive product. It is necessary to remove any paint, rust, or other grime to ensure clean metal. Once a weld is finished, a post-processing step is required to help polish, cut, or shape to the desired effect. Learn more about ARC Abrasives’ family of products and how they can suit your needs.